Life has not improved for the young fugitives since we left them in Life Is Strange 2, Episode 1. It's late November, snow is blanketing the Oregon wilderness where brothers Sean and Daniel have found solace in an abandoned cabin. It's been good for them so far, but they won't be able to stay forever. A short amount of time has passed, and Daniel's powers have grown since his supernatural fit at the end of Episode 1. Unfortunately, Daniel's health has decreased. Sean decides their only option is to walk two days to their maternal grandparents' house. 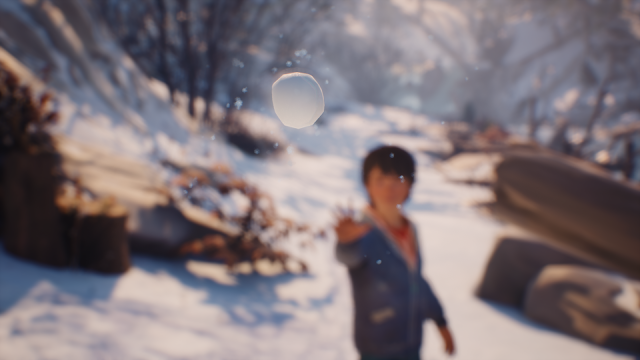 Related Reading: Catch up on Life Is Strange 2 with my full review of the first episode, Roads. 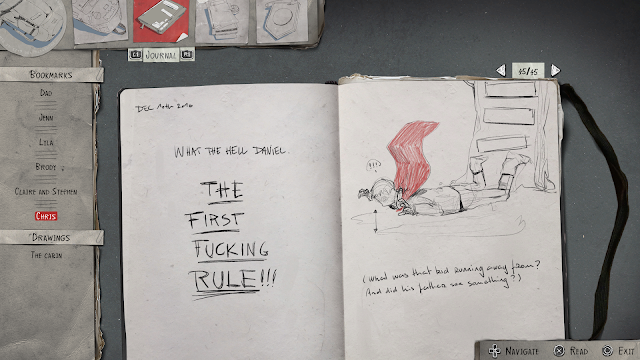 Life Is Strange: Episode 2 is titled "Rules," and rules are indeed the theme in each theme. Daniel is an excitable kid, and his newfound powers are (for obvious reasons) something he doesn't want to stop playing with. In the previous episode, Sean is very brotherly to Daniel, quite lenient as long as he is safe. But the telekinetic abilities change their relationship, likely permanently, as Sean needs to set hard rules and enforce them to a tee. Unfortunately, enforcement doesn't always end with a happy result. There are other restrictions placed on the brothers as their journey continues. Rules they need to obey in order to get Daniel the medicine he desperately needs. Everything is entirely believable and absolutely enthralling — minus Daniel's cough. I wish I was kidding. Everything about the episode is very intense with few breaks for laughter, but Daniel's cough inadvertently made me giggle and took me out of the tense moment every single time. The problem with the cough: it sounds so fake. I don't question how a teenager and a child have run from the law, by foot, for several weeks. I don't question the perfectly located abandoned cabin they happened to come across. I don't question Daniel's telekinetic superpowers. I do, however, question Daniel's cough that sounds like a child faking sick so they can stay home and play video games. There is no reason for a very sick child to sound perfectly healthy, including the worst symptom of his cough. Despite the inconsequential nature of the argument I've made, I struggle immensely with it simply because it makes my headspace leave the game. And I very much did not want to. But back to rules. Rules even invade playtime. For example, Daniel cannot leave the yard in case someone sees him. The brothers make up a dice game (or perhaps just drew one they knew by hand) that's set up with rules. And you can bet your bottom dollar that when they meet Captain Spirit, as promised in trailers for this episode, it will be through breaking at least one rule. Sean actually proves quite vulnerable throughout the episode, perhaps even moreso than in the first. There's this short moment when when Sean attempts to move a rock, in case he has powers too. My heart broke into to itty bitty pieces, because I know what he's feeling: that he isn't special. Daniel is special and Sean's job is to allow him to grow his talents while protecting him. But if he could move things with his mind too, they'd be on the same level again. They'd be siblings, friends again; instead, the relationship strains slightly to resemble that of a father and son. There is another moment where we see a bit of a break in Sean's tough outer shell, hidden in a drawing scene. Chris, AKA Captain Spirit, inspires him to add a layer of science fiction to the otherwise realistic scene. It's the one time we see Sean's mind flicker ever so slightly out of the scary real world, and he very obviously would like that escape more often than it is available to him. Related Reading: Trent adored learning about Captain Spirit — his review of the demo here. 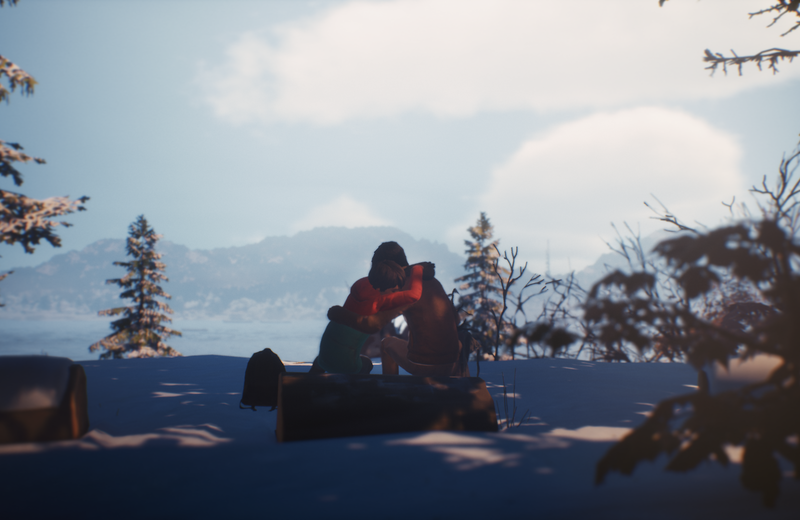 Life Is Strange has always been special when it comes to long pauses for reflection, and as a currently snowed-in Canadian the weather change really amps up the soothing factor. I can have Sean sit quietly, the only human for miles amongst the trees, rivers, and wildlife; the snow falls slowly from the midnight sky, and my eyes follow the footprints trails left by Daniel and the dog earlier in the day. Be still, my beating heart, for this is home. It feels right. What's also right is the snow mechanics. 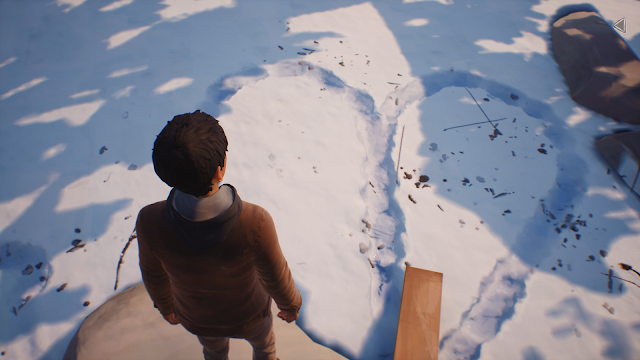 I rarely rave about graphics, but the way the brothers leave tracks in the snow, responsive to where Sean walks, just seems so remarkable to me. Maybe I'm easily amused. Some of my favourite moments in the episode, as with the first, were the long pauses Sean takes to sketch the landscape. I adore the way the focus begins as wide and broken up, and with each passing look gets more detailed. His drawings also fill his journal, describing his journey with Daniel and documenting his progress. It's sweet, like a baby book. The music feels extremely poignant, with the few voiced tracks being saved perfectly for long, calm times. Hats off, again, to Jonathan Morali for his continued incredible work giving emotion to the series through his compositions and song choices. Despite the incredible narrative build around telekinetic abilities, I do find myself missing Max's time travel ability, especially when I've made the wrong decision. This episode is very heavy when it comes to the fallout of Sean's decisions when it comes to allowing Daniel's to use his powers. After all, when he does levitate objects he's breaking the rules... and actions have consequences. Deadly consequences. Or you can make all the perfect decisions, I suppose. But nobody is perfect, not even in a video game, so why not explore the possibilities? If you've played the first game, you'll remember the importance of trains and tracks. Trains seemingly run through the veins of this episode, in my mind an instant nod to the tracks that ran through Arcadia Bay and what they meant to Max and Chloe. Trains represent freedom for the teenage girls of LIS, and after speaking with a lovely panhandling hippie girl seems to taken on the same meaning for Sean. Episode 2: Roads is a near-perfect continuation of Life Is Strange 2, save for my, erm, odd issues with Daniel's cough. The theme, the pauses, the characters, the music, the setting: it all adds up to a breathtaking experience that leaves me craving more. The ever-evolving relationship between Sean and Daniel is pure magic worth exploring.